Captains Log, Stardate 20100101.17: The Enterprise was attacked by a Romulan starship, the motivations behind the attack are unknown to me or my crew. As a result of this the Enterprise had been almost destroyed, and myself and my crew were forced to maneuver the ship to the nearest known planet: Vulcan. Fortunately, the Starfleets alliance with the people of Vulcan allowed us to keep the Enterprise in orbit around the planet whilst we enlisted the help of the best Vulcan engineers to make repairs to the Enterprise. All communication based devices have been down, until yesterday when the repairs were finally complete. I am very perturbed by the years worth of data missing from my Log, and hope to make up for it in the weeks to come. We have spent over a year stranded on the planet Vulcan and I have some to learn many things about Vulcan culture and traditions. They are a curious race, Vulcans, and have little time for pleasures and leisure activities. The humans on board have had a hard time adjusting to the Vulcan lifestyle. One of the most difficult things for us is that all Vulcans do not eat meat or any product that can be harvested from an animal, and they only eat for practical reasons so most of the food served at Vulcan food establishments is quite bland. This wouldn't have been a problem if the Enterprises replicator system was functional, but unfortunately it was one of the many systems to be damaged in the attack. 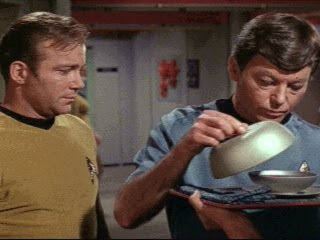 A very popular dish amongst the Vulcans is Plomeek Soup, which is more of a broth harvested from the Plomeek plant. It isn't bad, but despite its bright orange color there's not much more flavor than any typical vegetable stock on Earth. After a few months of eating this bland broth for breakfast every morning, myself and some of my crew decided that something must be done. We took some of the known edible vegetables of Vulcan and made a more flavorful and robust soup using the plomeek broth. We humans found it so delicious we decided to present it to the Vulcans, who found it too spicy and rich. However, we felt that the people of Earth should try the soup, and so I have transcribed a recipe using similar Earth flavors. I look forward to many more logs of our explorations to come, but until then, as the Vulcans would say... live long and prosper. Heat the olive oil in a large stockpot on medium heat. Add leeks, garlic, and a bit of salt and cook until they begin to soften. Add the carrots, lima beans, cauliflower, and green beans and cook for about 5 more minutes, stirring occasionally. Increase the heat to high and add the stock, simmer. Once it's simmering add the tomatoes, corn, and pepper. Bring heat to low and cook with pot covered until the vegetables are tender enough to pierce easily with a fork, about a half hour. Don't overcook. Add salt to taste. Remove from heat and blend together in a food processor. Add the parsley, basil and lemon juice. Some of the crew though it might taste good with sour cream or parmesan cheese and croutons as well. Yay! 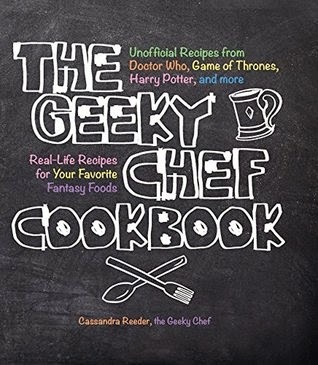 This looks like a wonderful, geeky, vegetarian recipe, all aspects of which I appreciate. I definitely will make this sometime! If you're looking for recipe suggestions, consider Mushroom Ravioli from the bane-of-literature's-existence that is Twilight. Hey, You should really update this blog more often. I LOVE cooking nerdy things. 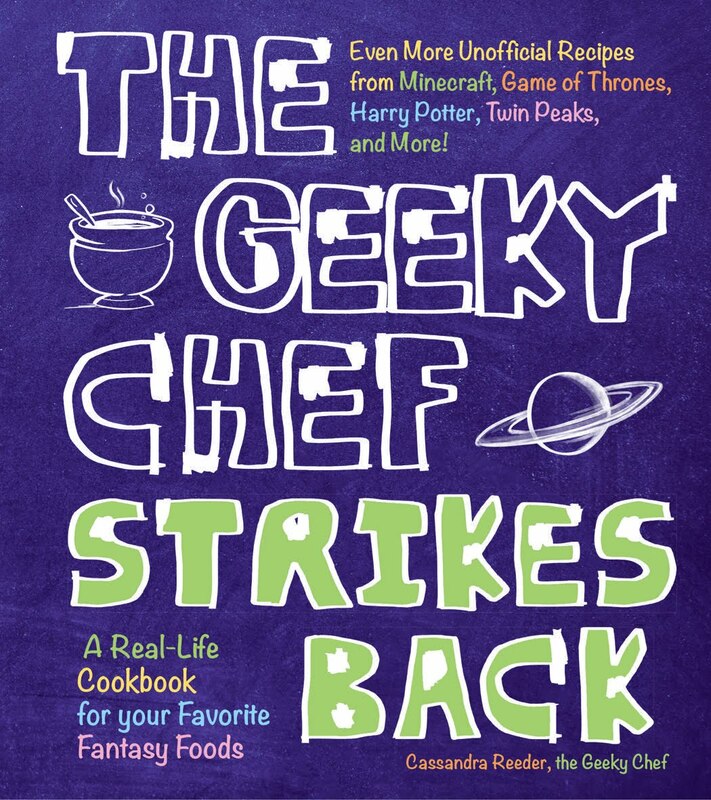 On a similar note, does anyone else have any other great websites such as this one that offer nerdy recipes? Does anyone know how many this recepie serves? I haven' tried to make it yet and I was just wondering if anyone remembers how much this makes. of different effects, because they've got a far better identify. Although a few things i needed I discovered below. There is no wrong or right method to build a website. related items. It’s genuinely your responsibility which usually method you intend to head out. type of had been critical. An answer would be wonderful! Maybe I completely missed it, but is there a serving size for this recipe? I made this and it was ridiculously good! For those asking how many it serves - there were three of us and it lasted probably through the week. :) I'll be making it again soon (my mom actually asked me to make it again), but with a little less garlic this time. It was a too much for my taste. Great recipe! !